Iguacu National Park, with the Falls as its main feature, was added to the World Heritage List for two reasons: its exceptional natural beauty and because it's the habitat of rare and endangered species. The Brazilian side of the park measures 170.086 ha. The adjacent Argentinian side is another World Heritage Site. The waterfalls on both sides together span over 2700 m., and have a height of 80 m.
Iguacu is an indigenous (Tupi-Guarani) name, meaning Great Waters. 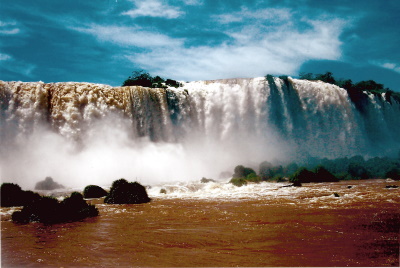 The Brazilian side of the waterfalls can easily be visited from the town of Foz do Iguacu. A bus takes you through the park, which is a bit too touristy for me (but maybe it has become necessary because of the number of visitors). There's a lot of (manmade things) to see and to do here, but I came only for one: to see the falls in all their glory. And fortunately that's still possible. From a distance of one or two kms (?) you get an overview of the number of falls that together form a big and broad front. A bit further on, you can get closer and let yourself get wet. Many rainbows colourize the falling water, lovely to see. The butterflies here also great to watch. In August 2018, I visited Iguaçu Falls on the border between Brazil and Argentina, the largest cataract system in the world. Iguaçu National Park in Brazil was added to the list of World Heritage Sites in 1987, three years after the complementary park in Argentina. Commentators often claim that one side of the falls is superior to the other, but having also visited Iguazu Falls on the Argentinian side in 2011, in my view, it’s a tie and both sides rank among the world’s greatest natural wonders as the best waterfall system. I also visited Parque das Aves, an aviary located near the entrance to Iguaçu National Park, which exhibits more than 1,500 birds from 150 species, most from Brazil, including toucans and parrots and plenty of unusual birds that I hadn’t seen before. More than half of the birds were rescued from mistreatment or animal trafficking. The park rehabilitates and releases into the wild as many of its birds as possible. From the Brazilian side of Iguazu Falls, though, you get the overview of the whole waterfall complex and, for me, this is where the true awe lies. It’s when you realise the scale of not just the individual cascades but the entire system that you appreciate this experience. The white animation of the water contrasting with the brown cliffs, the striking clouds on the blue sky mimicking the colour of the water, and the green of the jungle bringing it altogether… it’s a photographer’s dream. I couldn’t stop my camera, it was like it had a life of its own, and from every new vantage point there seemed to appear new angles that needed to be captured. I'd heard that Iguaçu National Park in Brazil offered the best views of Iguazu Falls, and the park did not disappoint. All visitors must ride a bus from the park entrance to the trails serving the falls, and I rather enjoyed the view of the rainforest from the top deck. 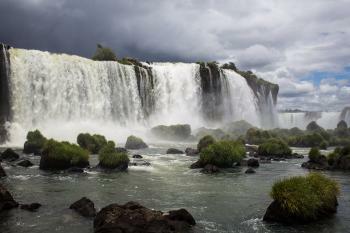 Once I arrived at the main trail, I was immediately captivated by the view of the Argentine falls near the boat dock. From the Brazilian side you can walk for somewhere between one and two kilometers and not run out of awesome waterfall views, which was the biggest surprise for me. At the end of the trail a boardwalk leading out to the Devil's Throat, a narrow U-shaped set of waterfalls, provides visitors with the best opportunity to get soaked by the spray from the falls (although vendors would be more than happy to sell you a poncho). A tower near the boardwalk also offers a panoramic view that's worth seeing. Iguazu Falls was as spectacular as I'd imagined, and I'm glad I took the time to see them from the Brazilian park when I visited in March of this year. Logistics: Iguaçu National Park is accessible by car or bus from both Foz de Iguaçu in Brazil and Puerto Iguazú in Argentina. The disappointing thing is that this is in the Atlantic rainforest of which only 7% remains. They need to more on the educational front with species under threat such as the harpy eagle etc. Recycling in the park but it all goes to the same landfill site. Tourism is good for the area but alot of work still needs to be done. This year in the June/July holidays, me and my family went to Iguacu National Park. I didn't realise that it would be so spectacular! Like Anne-Sophie Bertrand, I recommend seeing the Devil's Throat and also going on a boat-ride under the falls!!! You really don't know what your missing if you don't see the Falls in your lifetime! 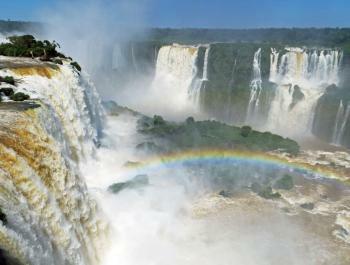 If anyone thinks they can get away with seeing only the Argentine or the Brazilian side of the falls, they are wrong!. It is vital that you see both sides to get the whole experience. While the majority of the falls stand on the Argentine side of the border, it is only from the Brazilian side that you can see the full panorama. The free bus service (included in the entry fee) that operates throught the park stops a several points where different views of the falls can be seen. Only after stopping off a few times did I begin to realise just how large the the falls really are. One word of warning however: please do not patronise the helicopters, they are believed to be causing damage to the fauna and flora in the National Park. I have been given the chance to live within the park boundaries for two months and to work there as a wildlife biologist. It was just the most intense place I have ever been in. There is so much energy once you get down into the Devil's Throat (which is the name of the main water fall). If you get the chance to go there, don't miss the chance to do some rafting in the Iguaçu River and enjoy the trails around it. But, remember : these waterfall are one of this world's wonders, they are to be respected (so...As your mom would remind you : put trash in garbages, don't feed the animals (even though they will look very friendly to you and to your granola bar...) and keep on trails). Thanks for them! Four issues: The Colon road, helicopter flights, dams on the Iguacu River, and management planning. Visual effects of Cloud, Fog and Mist: "The permanent water cloud from the cataracts forms an impressive scene"
Recommended for combination by AB: "..should be incorporated as one property with the existing Iguazu National Park of Argentina. 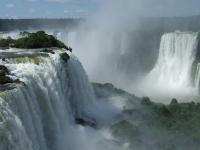 The name of the property would become "Iguazu, Iguacu National Park of Argentina and Brazil". 210 Community Members have visited.